While Facebook previously focused majorly on connecting people from around the world, the social networking giant has now diverted its attention towards building a much more cohesive community on the web. This involves Facebook placing focus on Groups and the conversations on the platform. Hence, the company is now rolling out a dedicated Groups tab in its core app. The company started testing a dedicated Group tab in the navigation bar on iOS devices back in June but the social media giant now seems to be rolling out the feature more widely. It has now made an appearance in the core Facebook app on Android devices, to the left of the notification icon. 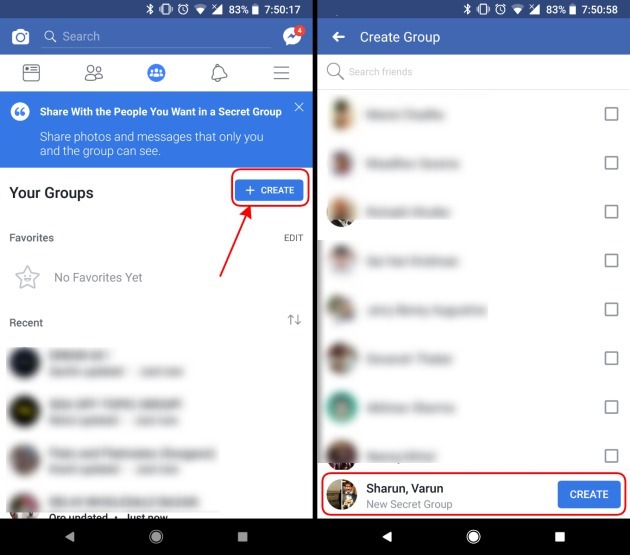 Facebook is tapping Groups in an attempt to provide you a wider range of options to connect and participate in discussions on the platform. The “Groups” tab includes options to create new groups, interact with your favorite ones, and those you’ve joined in the past. This tab would also give admins and members more control over the interactions they want to have on Facebook. Note: I tried this feature on my Google Pixel 2, running Facebook version 153.0.0.54.88. 1. After opening the app, go to the newly added ‘Group’ tab in the navigation bar at the top and tap on the ‘Create’ button at the right to begin the group creation process. You’ll then need to select your Facebook friends that you want to add to that group. 2. Once you’ve selected the people you want in your secret group, tap on the ‘create’ button you see at the bottom right. The group is now live and you can start talking about the topics you want. 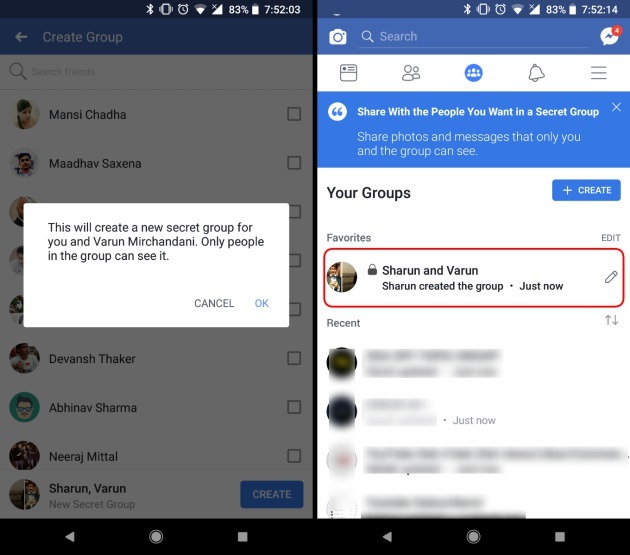 Note: You’ll see a pop-up telling you that the groups you create will be confidential and only the users in the same will be able to see the conversation within. With more than 2 billion monthly active users on the platform, Facebook is now turning towards to them in order to assist others in need of any help. This was the primary subject that the company addressed in its first-ever Community Summit a few months ago. It is now steadily executing all the plans it discussed to make Facebook more inclusive and safe for everyone. So, is the Groups tab appearing in your core app? And what do you think about the same? Let us know your opinion in the comments down below.